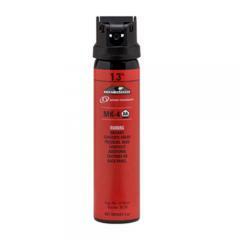 Trust Defense Technology for the most widely used pepper spray by corrections officers and law enforcement. The First Defense MK-4 Red Stream by Def-Tec offers a powerful Major Capsaicinoid formula that varies in strength from .2-1.3%. The strength variation allows for adjustments to the intensity of the spray stream depending on the situation. The stream pattern delivery is less impacted by weather conditions, making the MK-4 well-suited for targeted use outdoors. A nitrogen propellant deploys the spray at a 10-12 foot range for approximately 20-25 short bursts. All of Def-Tec's pepper spray products are independently tested by outside laboratories to ensure quality.